Sciblogs | How big is Venter's synthetic breakthrough? How big is Venter's synthetic breakthrough? Whenever geneticist Dr Craig Venter outlines new research he is involved in the whole world listens. That’s because Venter was involved in one of the biggest scientific breakthroughs of the last 20 years – the sequencing of the human genome. The implications of that advance for the field of genetics has been huge and helped pave the way for the $1000 genome which scientists claim they are close to cracking. Dr. Venter’s aim is to achieve total control over a bacterium’s genome, first by synthesizing its DNA in a laboratory and then by designing a new genome stripped of many natural functions and equipped with new genes that govern production of useful chemicals.He took a first step toward this goal three years ago in showing that the natural DNA from one bacterium could be inserted into another and would take over the host cell’s operation. Last year his team synthesized a piece of DNA with 1,080,000 bases, the chemical units of which DNA is composed. In a final step, a team led by Daniel G. Gibson, Hamilton O. Smith and J. Craig Venter report in Thursday’s Science that the synthetic DNA takes over a bacterial cell just as the natural DNA did, making the cell generate the proteins specified by the new DNA’s genetic information in preference to those of its own genome. So just how significant is this? Many scientists consider the latest development a landmark moment in science (see comments from scientists below). But as BBC Newsnight’s science editor Susan Watts points out, such is the hype that often surrounds Venter’s work, it is hard to know just how close to true synthetic life we actually are. Dr Venter has been promising this for years, and now that he has succeeded we’ll be hearing a lot about how he has “created life in the lab”. It’s not quite that – not yet – but it’s close. Dr Venter and his team built “Synthia”, as they’ve named their new life form, from snippets of DNA called “cassettes”. But he is still relying on a naturally-occurring microbe to act as a host – with its own DNA stripped out. Don’t misunderstand me. What Dr Venter has done is incredible science. I’ve already heard it described as Nobel prize-winning, “landmark”, work. But there is always an element of razzmatazz surrounding Dr Venter’s research that makes it harder to sift fact from hype. On the other hand you don’t have to go far to read reports of the dissenting voices who are worried that Venter is taking us down a dark and rocky path – one which will deliver us to an ethical dilemma as we gain the power to engineer life itself. ’Craig Venter’s step forward is to show that genomes — the stuff that programmes natural cells and organisms — can be made chemically in the lab and then transplanted and ‘booted up’ in another cellular host. This could eventually allow the genes for the synthesis of drugs or biofuels to be smuggled into bacterial or yeast cells, which could then be made to produce these useful products. This is one end of synthetic biology that might be termed ‘genome engineering’. ’Other groups, including those in the UK, are working at understanding how we might design and engineer biological systems at the more-basic molecular level; e.g., can we make miniature motors out of proteins and other molecules from first principles? This is a very exciting time for the emerging field of Synthetic Biology, and the UK has a key role to play in it. ’This latest announcement demonstrates the crucial role that engineering, chemistry, physics and maths play in driving forward developments in synthetic biology and that the range of UK research activities that we are supporting in this area will contribute to the advancement of this new technology. ’In synthetic biology we have a whole set of new possibilities to move from hypothesis to reality in areas as diverse as disease diagnosis, vaccines, fuel production or neutralising contaminants such as oil spills. “This is undoubtedly a landmark paper. The group has been building towards this step and, from their earlier published work, are leaders at synthesising and re-assembling large segments of DNA. There is already a wealth of simple, cheap, powerful and mature techniques for genetically engineering a range of organisms. Therefore, for the time being, this approach is unlikely to supplant existing methods for genetic engineering. DNA synthesis is rapidly becoming cheaper and so this could change, but not soon. ’This is a remarkable advance as it now provides a ‘proof of concept’ that we can chemically synthesise and assemble full genomes and transplant them into recipient cells, which after selection contain only the synthetic genome, and after rounds of cell division become a new and one might argue synthetic cell. The applications of this enabling technology are enormous and one might argue this is a key step in the industrialisation of synthetic biology leading to a new era of biotechnology. In detail the paper describes the chemical synthesis and assembly of the 1.08Mbp genome of Mycoplasmamycoides. This organism is a small bacteria and lives as a parasite in cattle and goats. Mycoplasma lack cell walls, have no discernable shape and are the smallest (0.1 µM) known free-living life forms and are most likely to have evolved from Gram-positive bacteria. They are present in both animal and plant kingdoms and act as colonisers. The choice of Mycoplasma by the Venter group for genome synthesis and transplantation is based on the small size of the genome and for the mycoides species has a reasonably fast growth rate. The difficulties they report in terms of getting the synthetic genome booted up were due to a single base pair mutation in an essential gene (dnaA) which they noted after several attempts. Correcting this mutation allowed the synthetic genome to work properly, although its not clear how the mutation occurred — whether in the synthesis or assembly step. 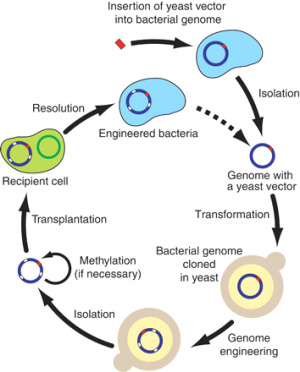 The transplantation process involves using an antibiotic selection process where the newly transplanted genomes infer resistance to the transplanted cell to live in the presence of a lethal antibiotic.